What a touching, acutely-observed drawing. That is so precious and real….You been blessed with a beautiful family and a wonderful talent. I am a brand new aunt. Babies are cool. Well done! You’ve made my day. I’m smiling inside and out with this little guy in my mind and heart. u made the sketch by yourself? COOL! Very cute! I am wondering – how long does it take you to finish one of these? Aww thank you. I really don’t know where my “talent” came from. I just draw what I see and try not to smudge it as i go along 🙂 I often wish i had other talents…. like being able to cook and not burn my food…. Awwww thank you! You’re too kind. You are very talented! You did a great job capturing the baby’s expression, so cute. For someone who can’t draw a straight line without the help of a ruler, what you are able to do is just amazing! Keep up the good work. Love your work!!!!! Love this little guy’s face…So realistic, I almost feel like I know him. LOL!!!! Very beautiful work throughout, but had to comment on this one as I am in need of a baby fix…. :) Thanks for sharing! You have captured a delightful expression typical of this age. Lovely! What a cutie pie! Love the expression, sooo sweet. You really worked that precocious smile and those eyes. Wonderful work! That is incredible how you have captured the baby’s expression. Simply stunning. So adorable. 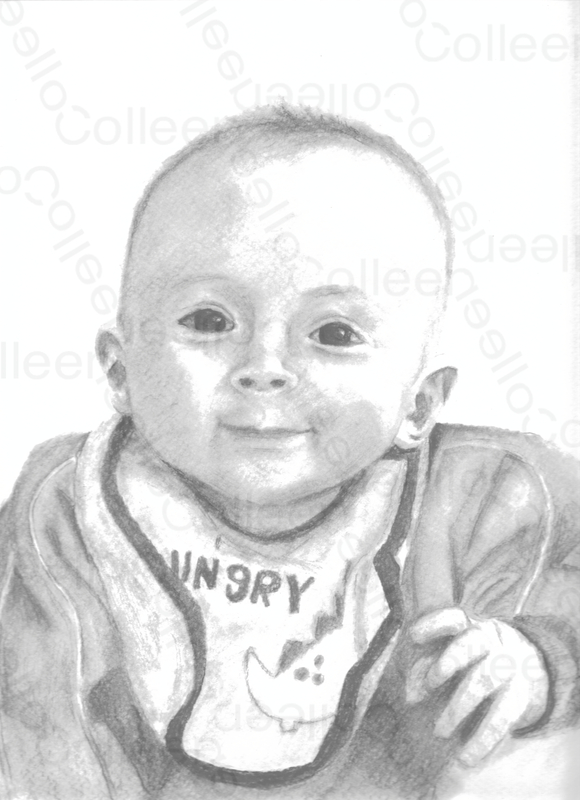 You really captured this baby’s happy spirit. awwww….. what a sweet face! You are an absolutely amazing artist! I thoroughly enjoy looking this your posts. This baby’s expression says so much. Thank you for sharing your talent with all of us. It is a true gift.